Bo and Trent are finally back from their Montana trip which makes me a happy dog to be back on our home water, The Little Red River. Yesterday we made a drift boat trip with our good friend George Born. Right off the bat George nailed this fat Rainbow on an old stand by olive Woolly Bugger and it looked like we were off to a great start. The water was very clear and it was a cool and overcast morning. 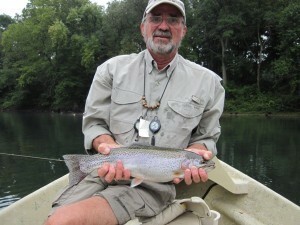 George caught a few more fish on his streamer but things slowed as the morning progressed. The guys made the switch to a #18 Redneck Pheasant Tail which turned out to be the fly of the day. It turned out to be an odd day as the fish were holding very tight to structure in the river and it sometimes took multiple drifts past the same structure to get a fish to come out and take a fly. 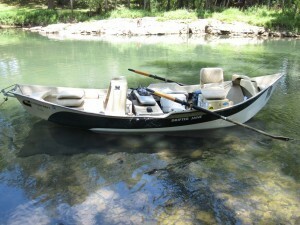 It was challenging fishing but at the same time very rewarding as they were really good quality fish. Bo has a lot photos from the Montana trip and we will get them up on the website soon. 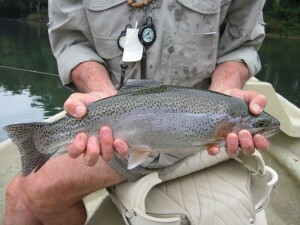 In the meantime, the fly fishing on our home water is moving into the prime fall season and Greers Ferry Lake and the Little Red River are in great shape. The Hybrids on the lake, as well as the Brown Trout, are moving into their most active time of the year and we hope you will join us at Empty Creel Fly Fishing Guides and Outfitter for your next fly fishing trip.